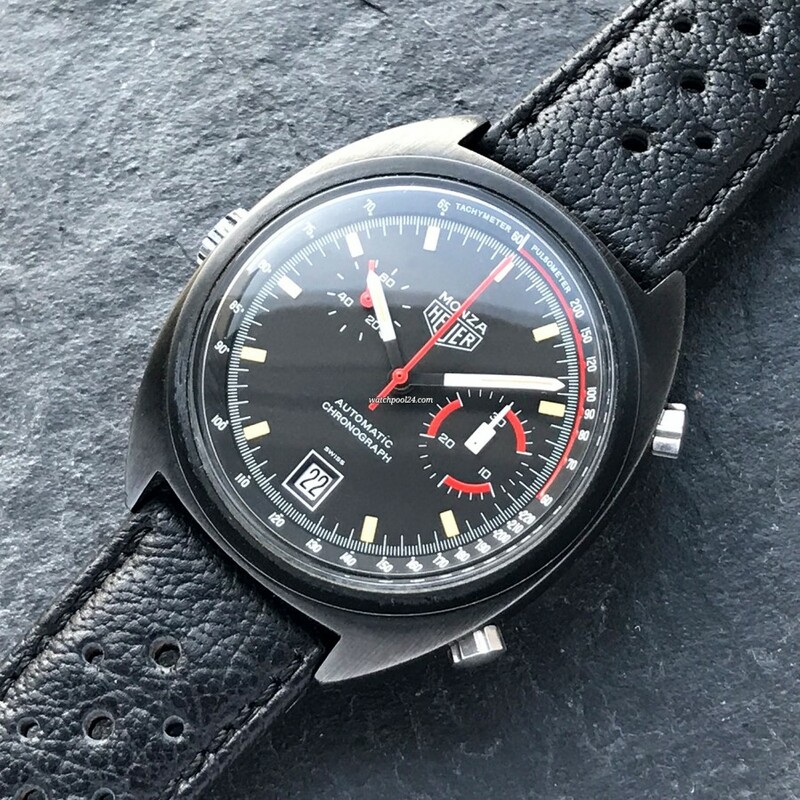 This is a very fine and authentic example of the Heuer Monza 150.511 with the black PVD case. This vintage watch from the late 1970s represents racing, masculinity and aesthetics. The Monza was presented to Niki Lauda for his F1 world title in 1975. Afterwards the watch came on the market. The combination of the black dial and the red accents looks sporty and very attractive. The tritium luminescent material has remained intact everywhere and has a creamy color. On the perimeter of the dial the pulsometer and tachymeter scale is attached. A trademark of this Monza variant is the unusual position of the sub-dial with the small second at 10 o'clock. The case with black coating (PVD) has been superbly preserved. It has hardly any signs of usage and seems to be unpolished or only slightly polished. The caseback bears the model name "Monza" and the reference number 150.511. The movement of this Monza is the automatic caliber 15. It is the improved version of the legendary caliber 11 of Heuer. The watch and the chrono are running smoothly. The Heuer Monza 150.511 PVD is a "killer chrono". Sporty look, the relation to racing and the rarity makes this watch very popular and sought-after. Your internet connection is pretty slow. Do you have any questions or need assistance?